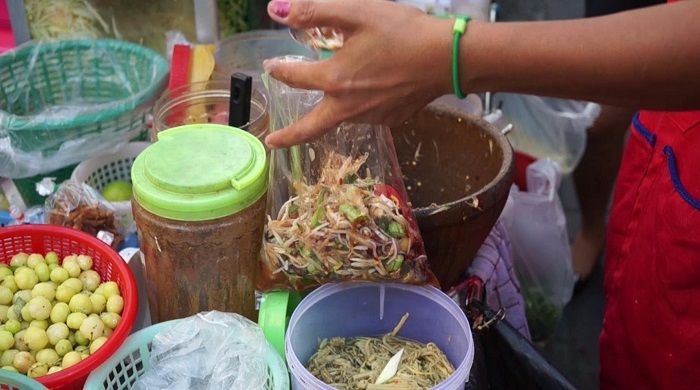 Street Food From Bangkok All Of Us NEED To Try ! 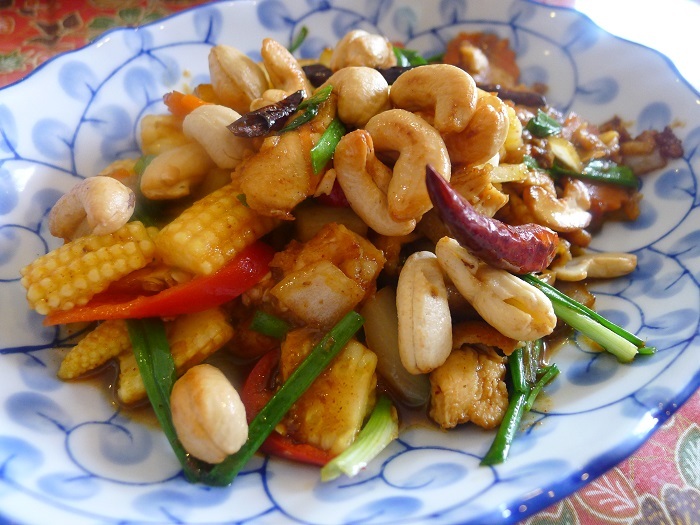 Thai cuisine is one of the most celebrated foods all around the world and quintessential Thai food has the potential to rouse all your taste buds as the sweet, sour, salt and spicy flavors are in equilibrium. Although Thai dishes are available in many other countries, the best place to dive into the authentic Thai culinary is in the country itself. 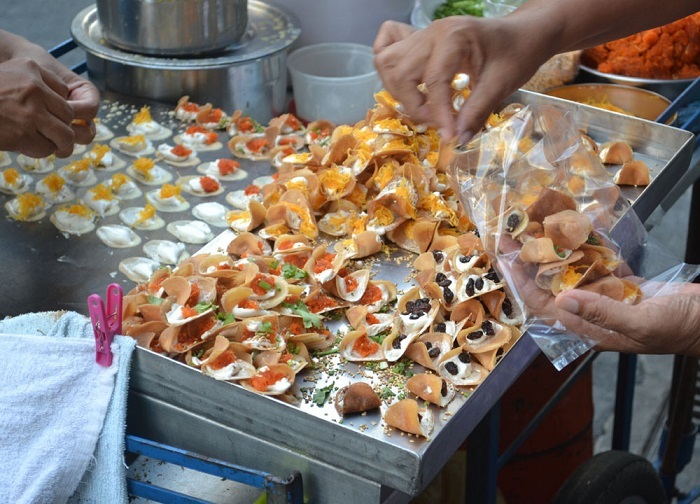 The street food hawkers are the best bet to take you on a trip through the vast ranging Thai gastronomy. 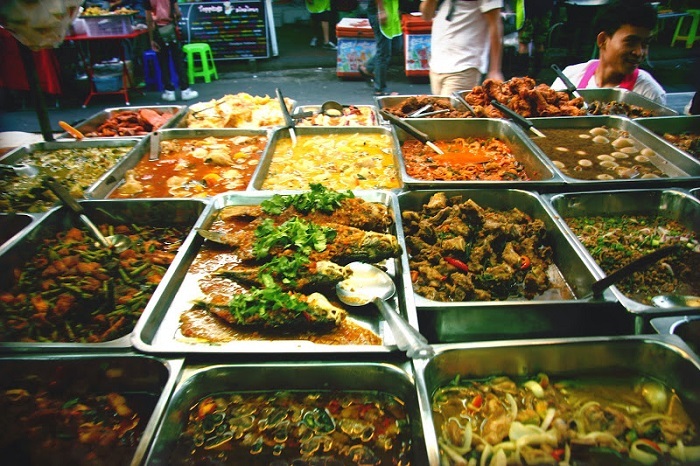 The food of Thailand has a variety of ingredients which are combined in the most unique way to create a superb, flavorsome cooking affair. Blends of crispy, crunchy, slick, smooth, grainy and sticky textures, these foods have it all that takes to be complete in the true sense of the term. This place has an innovative sense of mix-matching divergent tastes in one food item, which is in fact the stand-out nature of this cuisine. 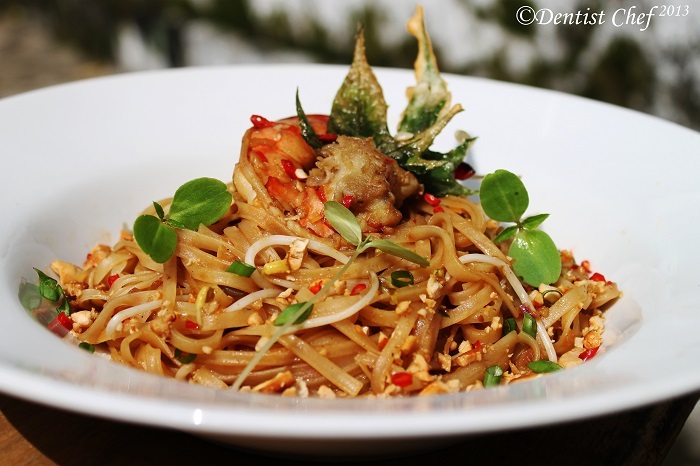 The Thai cuisine has an ample range of dishes to offer and each one has a variety of options to choose from. When in Thailand, you neither need to tolerate hunger nor compromise with your preferred taste. Som Tam is one of the most famous Thai salads which boasts of the perfect blend of sweet, spice, salt and topped with a tinge of tang. The key ingredient in this healthy hearty salad is green papaya which is shredded with beans, chili, pla ra, brined crab, hog plum, and lime in a dish which is laid in a big mortar and crushed with a pestle which results in the incorporation of all the five tastes, creating the scrumptious salad which makes one drool. This is a favorite among all because of its nutritious quality, but it is preferred more by women as even a plate full of this assortment does not worry them about their weight. On the 2010 list of the most delicious dishes on CNN Go, this dish landed the 46th spot. 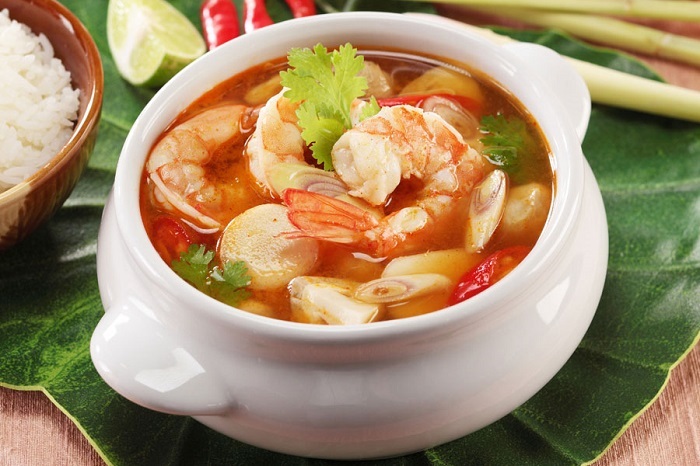 The tom yam soup is regarded as the national soup of Thailand, and is included on the menu of every big restaurant and even street food hawkers. ”Tom” refers to the process undertaken to make the broth while “yam” refers to the typical Thai sweet and sour soup. The creamy soup with veggies, fish or meat, along with spices, condensed milk, tangy tomato and lime, fashion the typical essence of Thai food. 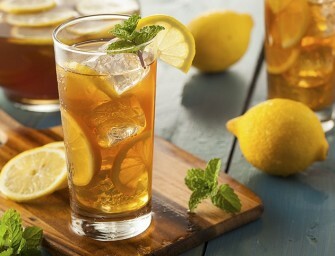 This refreshing glass of blissful tea is something which has the capacity to quench one’s thirst in the most delectable way. This is one of the most popular beverages in Thailand and it is worth a try if you are on an explorative spree of Thai cuisine. 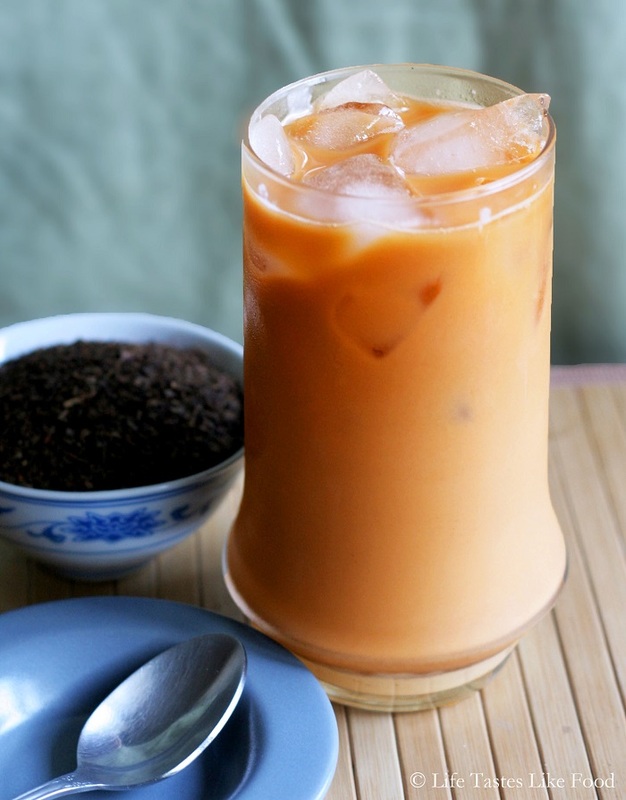 The original version of this drink uses Ceylon tea but owing to the high price of Ceylon tea, people nowadays use cheaper teas also to make a glass of Thai tea. This tea is sometimes served hot and preferred by Thai people in the morning to kick start the day but It is usually chilled and served with ice, complimented with a generous amount of condensed milk or coconut milk to give it that creamy texture. This food basket from Thailand comprises of fish, fish sauce, red curry paste, sugar, rice flour, lime leaves, basil leaves, coconut milk and eggs. 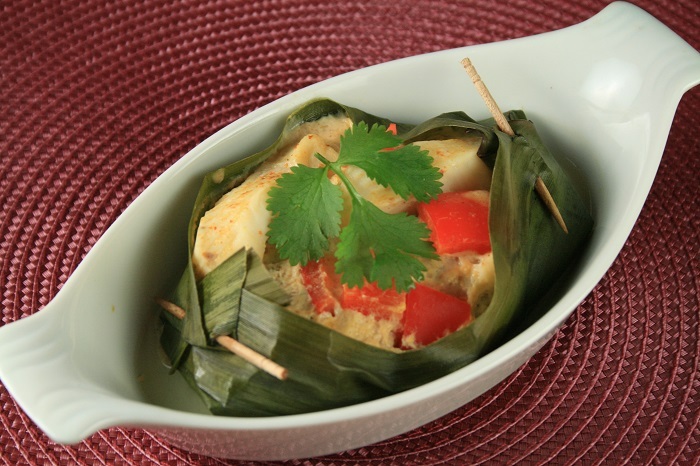 In the authentic Thai recipe, banana leaves are used as the mould into which the ingredients are carefully placed layer by layer and then steamed. This is topped with cream, bell peppers of different colors and other garnishes and one bite of this perfectly constructed food speaks for itself as to why it is worth trying. As the name suggests, these noodles has some connection to boats. Yes! These were initially sold on boats floating on the Thailand Khlongs, providing food to unsatiated travelers. Even now, this dish is available on the boats as well as sold near the canals which are always crowded with customers as this small bowl of strings is a country-wide crave. Rice noodles swim in thick spicy soup along with minced meat and topped with spinach. One bowl is available at a price of approximately 10 baht, but the vitalizing taste of this dish will not let you stop at just one bowl. The curry buffet is one such collection of Thai cuisine which offers a wide range of popular Thai food at comparatively lower prices. In the places where curry buffet is served, one can absorb the true essence of Thai gastronomy as they serve a variety of Thai curries along with rice and fried items too. One can order any combination of curries along with rice and savor the flavorsome platter. These are mostly available at lunch time and the stalls are clamored by people crowding around them. 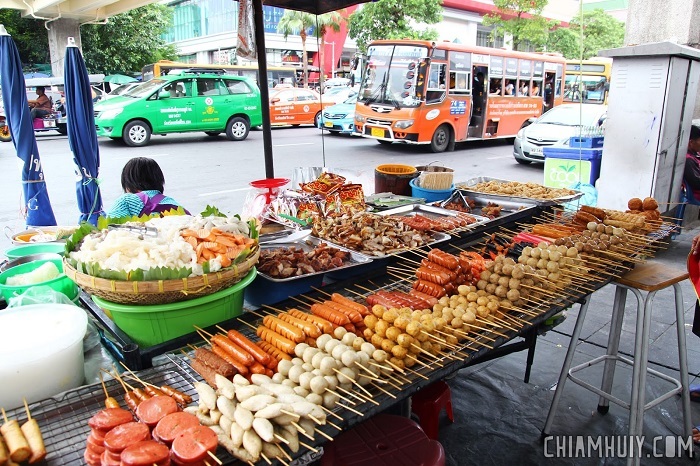 One of the perfect street food snacks in Thailand is the assorted meatballs and sausages which are easily available on push carts or food stalls. If you are wandering on the streets of Thailand or waiting for someone, this is the best way to kill time with the assurance of you not turning grumpy. A scintillating plate of this Thai dish can work as an appetizer and its magnetic aroma is alluring. A serving of Gai Pad Med Mamuang accompanied with a bowl of rice makes a perfect stomach-full platter to feast on. The other ingredients that add to the flavor of the food are baby corn, spring onions, dry red chillies, spices and sugar. The tender meat is well complemented with the crunchy roasted brown cashews, while the other ingredients give it its juicy texture. Pad Thai is one of the most renowned Thai street foods and is available with the street hawkers at approximately 40 baht for a decent serving. The noodles are stir fried to give it a glossy look and added with eggs, prawns, spices and chicken or vegetables to make it as mouthwatering as it appears. The ingredients may vary from vendor to vendor but the golden brown noodles are the secret to this dish. It also has sprouts and peanuts which add to the crispiness of the dish. Garnished with greens, this platter is an example of aesthetic pleasure. Thick pork pieces dipped in sweet honey and brown sauce, marinated well before placing in on the grill is the way most Thai people enjoy their pork. The essence of honey and the sauce soaked with the pork make it salivating and tender. Grilling gives it the smoky far-distant aroma which charms people around the vicinity and drawing them to the stalls where it is cooked. 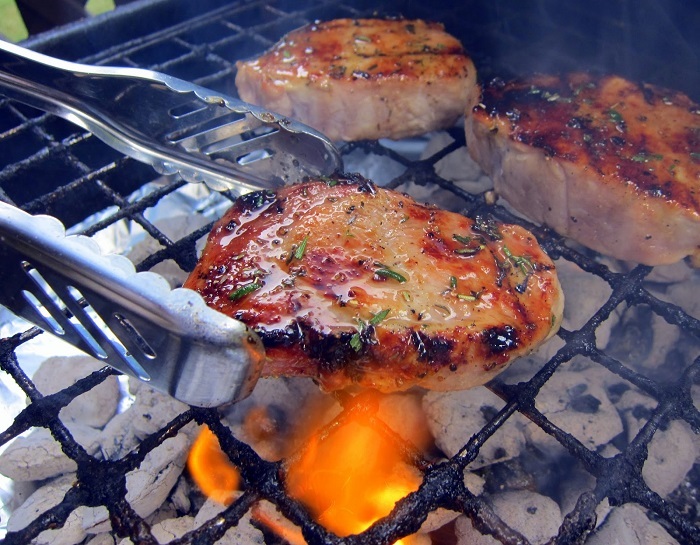 The caramelized dark brown pork chop is a recommended dish for all tourist and is a raving popularity among the locals. 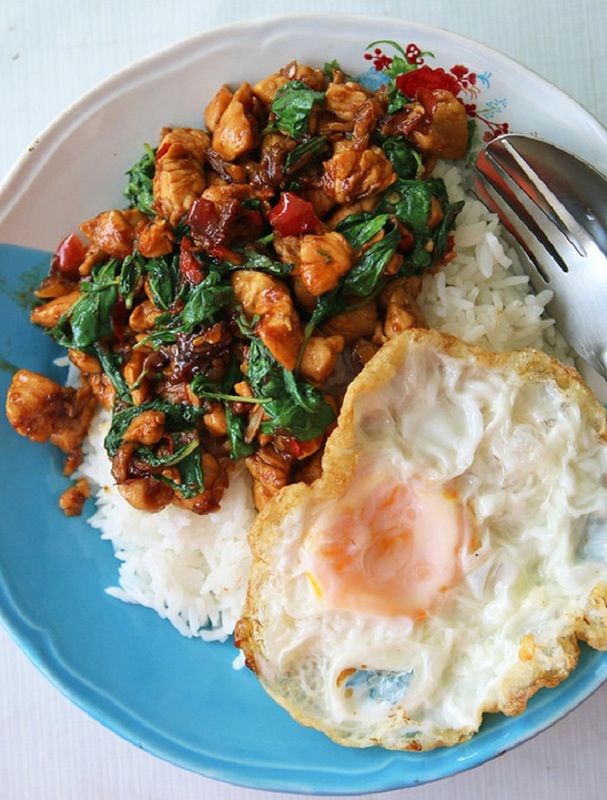 Chicken flavored with basil leaves is a must try for all those who want to try Thai cuisine, and it is also famous as a street food in Thailand. If you are in Thailand, starving and clueless as to what will fill your tummy, this is a good option to satiate one’s hunger. This is one of those dishes which is found at almost all the street food joints and even strays from burning a hole in your pocket. This tastes best with a serving of rice and fried egg. 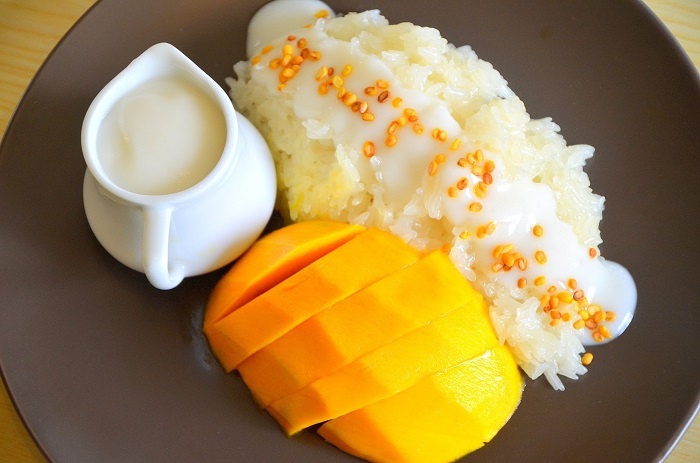 One of the simplest dishes of Thai cuisine is the khao niew ma muang, which is also known as mango sticky rice. The recipe is just a replica of the name as in mango sticky rice you will find sweet and salty steamed rice poured with smooth coconut milk and accompanied with ripe mango. To add a twist, some soaked moong is drizzled over the rice to give it a granular feel. Depending on the quality of the mango a decent serving of this food can price ranging from 60 bahts to 100 bahts. 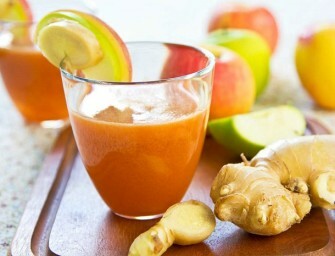 This can be savored as a snack or as light meal, depending on how big your belly is. Khanom Bueang has two varieties- kanom buang yuan and kanom buang thai, Kanom buang thai being the more popular street delectable, consists of a mold made of rice flour unlike taco which is made of corn flour. The mold is then filled with coconut cream filling and is topped by either shredded coconut or egg yolk while on other occasions it is topped with shrimp paste. Whether it is served as a sweet pancake or a hot spicy one, this dish remains to be one of the most desired Thai snacks, and is accessible as well as affordable as you can get five crepes of different flavors at the price of 20 baht. A thin pancake resembling an Indian roti is filled with banana slices and wrapped, which is then fried crisp till the crusts turns brown on a flat pan. This filled pancake is finally topped with a hearty amount of condensed milk that makes one drool and if you want to plunge into the sweetness of Thai cuisine then this is an ideal way to fulfill your desire. The creamy layer of condensed milk then leads to the crispy pancake coating which in turn takes one to the juicy silky banana filling is just a warm welcome for any sweet tooth. People who do not prefer condensed milk have other options such as chocolate, coconut, honey or sugar. This can be topped with practically anything sweet and this is where you can use your imagination to bring out the best of this snack. This creamy delectable treat is a relief during the hot summers as it has a cool soothing effect on the body but its high taste quotient creates a longing for the tongue even when you have just consumed one a few minutes back. . It is made with coconut milk and has crushed peanut, which is usually served in a coconut shell or banana leaves cups or used as a filling between two buns. 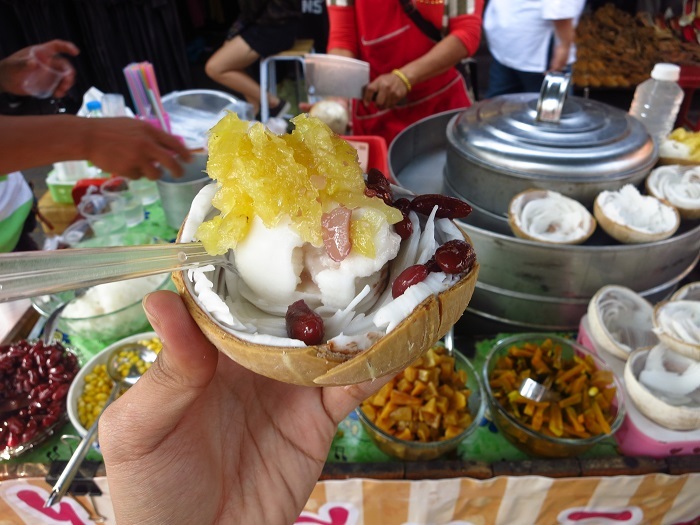 This can have toppings of your choice, and is sold by the hawkers at around 35 baht per serving. 20 Traditional North Indian Foods That Will Change Your Life Forever! 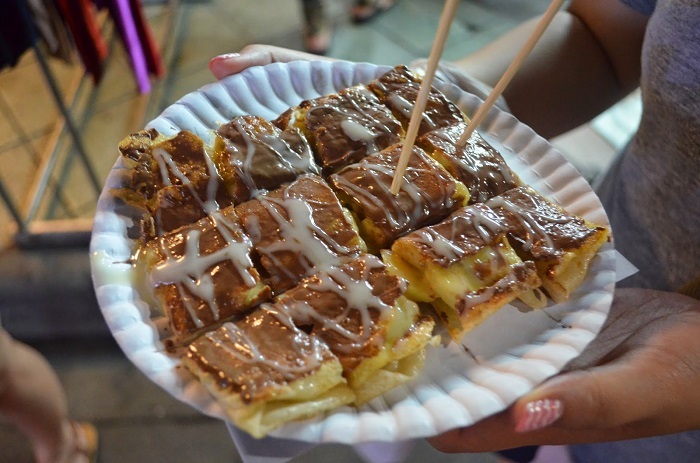 Street Food Of Singapore Will Leave Any Foodie Drooling!